Discussion in 'T&AA - Travel and Anything Automotive' started by abhi0008, Aug 11, 2012. Its gonna be war of the century.....CLASH OF THE TITANS. I go for the HUNK!!!! What u say people??? Purely for the looks, the old one. It still has that butch feel about it, the new one feels like harman baweja, trying real hard, but just not getting it right. The new one is a great machine, giving the Fortuner even a run for its money, however not now, ( since its coming in as a CBU - Completely built up unit ). Once it starts coming in as a CKD ( completely knocked down ), the prices can be lower. This what we're talking about.. This is Google gave me .. post pics for such future discussions ..
the new one feels like harman baweja, trying real hard, but just not getting it right. A car comparable to Harman Baweja? I think the case rests right there! 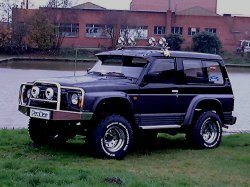 please consider my wild card entry, the nissan y60. ^^ Yup, I love the evoque too... however for the price... its not even competing. And this is essentially sibling rivalry.